Advantage Basketball Camps has selected Badens newest basketball, The Contender, as our official basketball. 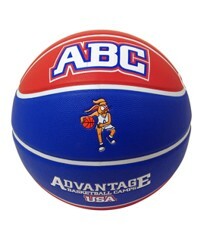 This is a professional-grade, top-of-the-line game ball featuring the Advantage Basketball Camps logo. The Mens size 7 regulation basketball has a circumference between 29.5-30 inches, it weighs 20-22 ounces, and has a diameter of 9.39 inches.